UGI is proud to support local Society for the Prevention of Cruelty to Animals (SPCA) centers in Pennsylvania to help further their mission of ensuring that all animals are treated with kindness and respect. This November, UGI has selected the SPCA as the Featured Community Organization and reminds customers and the community to keep pets safe from the cold this winter. Pets burn extra energy by trying to stay warm in wintertime. Feeding your pet a little bit more during the cold weather months can provide much-needed calories. Ensure that outdoor water sources for pets and livestock are checked frequently as they can freeze over and prevent their access to water. Be sure to thoroughly clean up any spills from your vehicle, and consider using products that contain propylene glycol rather than ethylene glycol. Like coolant, antifreeze is a lethal poison for dogs and cats. Allow your dog to maintain a longer coat, which will provide more warmth. If your dog is short-haired, consider getting him a coat or sweater with coverage from the base of the tail to the belly. Remember, if it’s too cold for you, it’s probably too cold for your pet, so keep your animals inside and give them a warm place to sleep. If left outdoors, pets can freeze, become disoriented, lost, stolen, injured or killed. 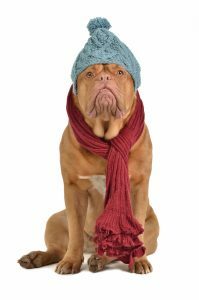 Remember it is illegal to leave pets outside in extreme temperatures, especially without food and shelter. If you are aware of a situation where a pet is being left outdoors, speak out. Contact SPCA’s hotline, at 1-866-601-SPCA. For more safety tips on how to keep your pet happy and healthy in the cold weather, visit www.aspca.org. Visit www.ugi.com/community for more ways UGI helps those in our local communities!